Nimish Shah has been performing robotic radical prostatectomy for the management of prostate cancer since 2006. Cambridge was one of the first centres to introduce robotic prostatectomy in the UK in 2005. Nimish has personally performed over 800 of these operations to date. In 2015, we saw the first national individual Consultant outcomes publication of radical prostatectomy surgeries performed in England during 2014, by the British Association of Urological Surgeons. Data was submitted for 5814 patients from England out of the total 6651 radical prostatectomies performed (87% return). 55.6% of cases were performed robotically overall. Median number of cases per consultant was 31 cases (range 1-137 cases). For the first publication, information released to the public included number (including technique) of operations by each surgeon and centre during 2014, with information about blood transfusion rates, post-operative complications and length of stay (Radical Prostatectomy Outcomes Data). Nimish Shah performed 133 robotic radical prostatectomy surgeries in 2014, second highest volume robotic surgeon in England. Data was submitted for all surgeries performed. The blood transfusion rate for his patients was 2.27% (England average 2.7%). His complication rate was 3.01% (Clavien Dindo III and above, England average 1.62% with 88.5% overall data return and incomplete recording in 26% of the returned data where patients had complications noted), and median length of stay 1 day (range 1-3, England median LOS 2 days). The audit collected considerable additional operative, pathological and follow-up data which has at this stage not been available to the public domain. An important measure for prostate cancer surgery to assess completeness of resection is the positive surgical margin rate (presence of cancer glands at the resected margin). 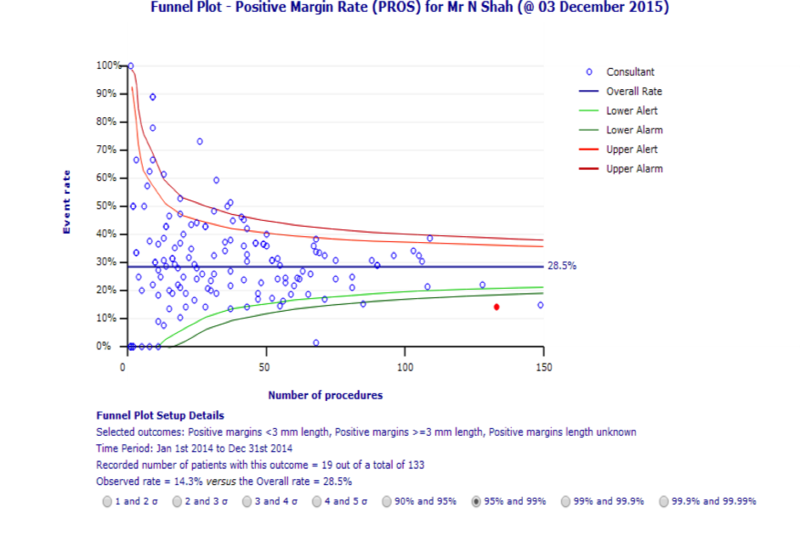 As seen from the funnel plot below, Nimish Shah’s (red dot) overall positive margin rate was 14.3% against the national average of 28.5%, with the positive margin rate for pT2 (organ confined cancer) of only 6.8%. 55% of cases were pathologically pT3 (extracapsular disease) and 94.7% of cases had Gleason 7 or higher grade disease on final pathology (ie intermediate or high risk disease). The 2015 patient data shall be analysed and comparative individual surgeon data shall be formally published nationally in summer 2016. Nimish Shah performed a total of 156 robotic radical prostatectomy surgeries in 2015 with a blood transfusion rate of 1.3%, overall positive margin rate of 11.5% (positive margin for pT2 disease of 4%). Nimish Shah’s expertise and experience in robotic surgery has attracted increase in referrals from across England, as well as regular referrals from Jersey and Northern Ireland.